Photo by Don Hunstein, courtesy of Sony Classical and Glenn Gould Limited. possible, Eatock presents them in their own words, in Q&A interviews. 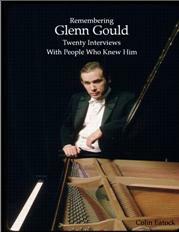 Listen to various interview excerpts conducted by Colin in preparation for his book. Colin Eatock is a composer, music critic, author, editor and educator. Born in Hamilton, Canada, in 1958, he has lived in Ontario all his life (except for one year in London, England), and has called the city of Toronto home for the last quarter-century. Eatock frequently writes about music for Toronto's Globe and Mail newspaper, and has also written for the New York Times and the Houston Chronicle. As well, he has contributed to many periodicals, including Queen's Quarterly, the Literary Review of Canada, Opera Canada, Opus and the WholeNote in Canada; American Record Guide, Early Music America, Listen and Strings in the USA; and BBC Music, the Strad, Opera, Musical Opinion and International Piano in the UK. His first book, Mendelssohn and Victorian England, was published by Ashgate Press in 2009. As a composer, Eatock has written songs, chamber music, choral works and orchestral compositions. His music has been performed and broadcast in Canada, the USA and the UK, and has been released on the Furiant, Echiquier and Toreador record labels. He is also an associate member of the Canadian Music Centre, where most of his scores are available. A CD wholly devoted to his music, Colin Eatock: Chamber Music, is a 2012 release of the Canadian Music Centre's record label, Centrediscs. Eatock holds a PhD in musicology from the University of Toronto, and has also lectured at the U of T. As well, he holds masters degrees in music composition (U of T) and music criticism (McMaster University), and a bachelor of music degree (University of Western Ontario). Before he became a freelance writer, he worked for ten years within the administration of Toronto's Canadian Opera Company, as an editor, publicist and fundraiser.